Don't let acne get you down! 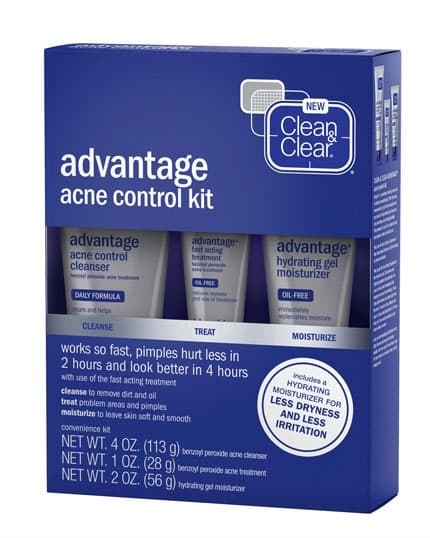 CLEAN & CLEAR ADVANTAGE® Acne Control Kit comes complete with new formulations to help prevent and fight acne breakouts without over-drying skin. This 3-step regimen treats existing acne while helping to prevent new breakouts from forming. The treatment works to reduce acne fast. Pimples hurt less in 2 hours and look better in 4 hours. Step 1: Acne Control Cleanser clears away dirt and oil, while helping to prevent the development of new acne breakouts. Step 2: Fast Acting Treatment penetrates into the pores to help clear existing acne breakouts and fight oiliness and shine to keep skin looking fresh and clean. Step 3: Hydrating Gel Moisturizer nourishes skin with ingredients that fight dryness and keep skin looking healthy. Wet face. Gently massage all over face, avoiding eye area. Rinse thoroughly and pat dry. Because excessive drying of the skin may occur, start with one application daily, then gradually increase to two times daily if needed or as directed by a doctor. The only thing that clears my acne as a 19 year old with acne prone skin! Just wish they didn't stop selling it in stores.. Thanks so much for taking the time to write this review and we'd like to learn more about your experience with our kit. Please give us a call at 1-877-754-6411, Monday - Friday from 9 AM to 5:30 PM ET. We hope to chat soon! I absolutely love these products. My skin is very oily, but then dries out quickly. Benzoyl Peroxide is good for clearing acne on my skin and these products, along with a couple of others from Clean and Clear offer it! The combo of the first two steps with the Hydrating Moisturizer help buffer between oily and dry. The only thing I don’t like, which isn’t the products fault is that Benzoyl Peroxide stains clothes and material. Also, this product isn’t sold everywhere. I haven’t been able to find it several stores recently including multiple Targets and CVSs. I do wish the products could be sold separately, but I just use this regime at night, and then use another clean and clear face wash in the morning, to save on product. This kit works wonders. I used to use Proactiv but switched to this and it's a much cheaper alternative that works the same. I'm really frustrated that the parts aren't sold individually. I now have 6 extra fash washes and I'm always having to buy the kit to get extra moisturizers. I've tried some of the other moisturizers that you sell but they're not the same. I would recommend if the products were sold individually, but it's such a huge pain that I'm going back to Proactiv because at this point I'm paying for product that I don't end up using. The product might be good but it did not work for me at all. I used all three sproducts stepwise one night and when I woke up the other fay my skin was burnt like a severe sunburn and it was extremely itchy. I was so stressed for days because I could not go out without makeup for days it was so pink and dry. It dried out so much I had to resist rubbing it. This product should not be sold without warning saying benzoyl perorxide is too strong and should not be used just as is. 3 weeks later, I thought I would have overused so I just used the cleanser and hydrating lotion but did not use the acne treatment tube in the end - results? Same. I burned the skin again and woke up at 3am in the night from the use the night before and put my usual clean and clear face eash with moisturizer which contains salicylic acid. I would not recommend this product without a patch test. My money is wasted on this, I am not risking my skin for any more burns and extreme dryness. This is the max strength stuff and not for gentle works. We're very sorry to hear about your experience with our kit. We'd like to learn more about this. Please give us a call at 1-877-754-6411, Monday - Friday from 9:00 AM to 5:30 PM ET. We look forward to speaking with you! I’ve been using another product with similar ingredients to this trio and was less than happy with my results. The cost and effectiveness compared to Clean & Clear is night and day. The Advantage Acne Control Kit is less harsh on my skin but just as productive, if not more so! I wish I had known about this kit WAY sooner! I’ve always struggled with cystic acne and I’ve been to multiple dermatologist’s who prescribed me cleansers, gels, moisturizers that cost an arm and a leg and didn’t do much to help me without first causing intense redness, burning and itching. Clean & Clear has changed my life. I’m more confident and feel comfortable in my own skin. Great product but you should sell the products inside the kit individually. I bought the kit not knowing the products inside weren't sold individually. If you run out of one product you shouldn't have to buy the whole kit just for that product. You then end up with a whole bunch of moisturizer for example. I'd keep using if the products inside were sold individually. If you don't mind this problem you should buy it. I bought this product at my local Wal-Mart thinking it would work mericals like it looked like after 4 weeks I saw little improvement. I works just like a cleaner and it is nothing special. I am yet to have clear skin. Hi Mikayla! We're sorry to hear that this one didn't quite work out. We'd like to learn more. Please call us at 1-877-754-6411. We're available Monday through Friday, 9am to 5:30pm ET. We look forward to speaking with you!